From Charlene Doyle of Greeneville, Tennessee on 1/9/2018 . I enjoyed the story immensely and how love, even tough love changes hearts. From Marcia Leastman of Mesa Verde, Colorado on 12/26/2017 . This is my favorite! I've listened to it over and over. An excellently done drama that captures your attention from the start. You are enjoying the story so much you don't realize the many life lessons you are learning. Good for all ages - you can't go wrong with this one! From Ellen of Thornton, Colorado on 8/10/2017 . Not only is the story very well done, but it addresses being self centered, selfishness (narcissism) that is running rampant in the youth of today...even those in the church! Sir Malcolm and the Missing Prince. From Heather T of Wildwood, Missouri on 7/19/2017 . I wish all the lamplighter audios were a mandatory part of all schools. Every family should have this entire library in their homes. We love love loved this story ! We adore all of the lamplighter audios. We absolutely hang on every word & feel as if we personally know the characters in every story - I cry & laugh & cringe! They are so exciting, moving & touching. We also see the courage that rises up & the character that is produced through suffering. These stories are real & inspiring - I shall be giving them as gifts to everyone! From Tarah Lee of Eldridge, Iowa on 1/29/2017 . My son and I greatly enjoyed listening to Sir Malcolm and the Missing Prince. Very well done, highly recommend it! From Rachel of High Falls, New York on 12/20/2016 . Very engaging story and lesson about serving and learning to put others first, as well as developing a firm foundation based on God's word and a love that keeps you on the straight and narrow path of truth and peace. From Heidi Olson of Branson, Missouri on 12/14/2016 . Sir Malcolm has been my family's favorite for years. To experience the transformation of Hugh and watch him stand up for righteousness is inspiring. The story is filled with fun adventure and rich lessons. Definitely recommended! From Andrea Dvorachek of Lagrange, Indiana on 8/6/2016 . We have these already and liked them so much we ordered some for prizes for our award night at our VBS! From Carrie Horn of Webster, New York on 5/23/2016 . This was a wonderful audio book! It was presented so well and captured my attention right from the start! I would highly recommend this Audio Drama! From Anonymous of Jacksonville, Florida on 4/25/2016 . Listened to this with my kids in the car. They were excited and exclaiming over it the whole time! Will be purchasing more from Lamplighter for sure! From Brooke Kaczor of Oneill, Nebraska on 2/8/2016 . I wasn't sure what to expect in the story, but it is wonderful. It teaches a simple lesson with a great ending. Malcolm takes the foolish spoiled Prince to a special place to learn a special lesson, one that we all ought to consider. Make sure you get this one. It's a keeper. From alena sivacheva of vancouver, Washington on 1/22/2015 . Awesome story!!!! Would totally recommend it to those kids that are ready to help and need guidance in the family. My son is nine and he is at a point where he needs to contribute to our family. He is capable of so many tasks but he doesn't want to. This story really got him thinking. He doesn't give as many excuses as before. Now its more of OK mom or sure phrases. Thank you Lamplighter Theatre for this awesome character building story. From Trisha of Sunfield, Michigan on 1/2/2015 . Love this story! I received it as a graduation gift when I graduated from High School, and listened to it numerous times while at college. It was also a great to listen to while I was driving the hours home over breaks! Thank you for quality products with wonderful spiritual lessons. From Anonymous of Tyler, Texas on 10/14/2014 . Sir Malcolm is for young men as The Basket of Flowers is for young ladies. It dramatized life values in a way that leaves you playing and replaying the CD. Defiance is in all of us. Sir Malcolm is a great spring board for discussion of teenage rebellion and rebellion against God. Our boys went from no way a parent would send a child away for 4-6 years for defiance to young Hue needed just what his father did. Thank you for this wonderful performance. Our boys listen to it often; the time setting of kings and knights appeals to them and makes the message more inviting. From Stefani Barnett of Fort Sumner, New Mexico on 5/21/2014 . I couldn't wait for our family to finish reading the book so we could listen to the audio drama (we always read the book first before seeing a movie or listening to audio dramas). The audio drama brings the story to life and really added to what we had already read in the book. From Jessica Krauel of Summerville, South Carolina on 5/4/2014 . I really enjoyed Sir Malcolm and the Missing Prince. It is such a good example of the need to develop the qualities of leadership and integrity in our children. What a great story!! From Anonymous of Ringgold, Georgia on 9/15/2013 . I ordered 3 of these for the children in Sunday School. The story is excellent! The order was a little messed up but was remedied very quickly. For my "trouble" Lamplighter sent a free download for another book! :) They didn't have to and I felt it very thoughtful. Thanks so much! From Anonymous of Gallatin, Tennessee on 8/27/2013 . A wonderful story wonderfully done! I'm thankful for the reminder that easier isn't always better. Thanks Lamplighter! From Justus (9 yr.) of Export, Pennsylvania on 7/29/2013 . Even though I've heard the ending already, I still enjoy hearing the whole story. Hugh learns and grows even though no one lectures him. It teaches me to make wise decisions, and not give up. The most important part of being a good King or Leader is serving others. From Jessica Cagle of Tunnel Hill, Georgia on 7/18/2013 . WOW! I heard pieces of this episode on WDYN and fell in love with it! This episode brought me to tears! The story related so much to our Heavenly Father's love for us...and how we go through battles to learn but He is always there. I encourage everyone to listen! This is by far my favorite! From Anonymous of Commerce, Michigan on 7/2/2013 . Our family ages range from 6-16 and every single one of them enjoy listening to the CD. The time goes quite quickly and if we take breaks they are excited to get back to the story. From Kimberly Jagen of Point Venture, Texas on 6/25/2013 . I love this audio and printed book. I cry every time. Gave it to every family in our church! From C Dueck of Emo, Ontario on 6/25/2013 . Powerful story that shows how training is needed to raise boys to be responsible men. Today's parents (and kids) need to be reminded that maturity doesn't just "happen," but must be modeled and taught. Thanks Lamplighter for this high quality and entertaining drama! From Anonymous of Cleveland, Tennessee on 6/21/2013 . This is a gem of a story. This is a prodigal son like story showing the love of a determined father. Highly recommend for all ages of the family. From Caroline Eichelberger of Fruit Heights, Utah on 6/20/2013 . We all enjoyed Sir Malcolm on a long car ride. Not only did the kids (girl-3, boy-5, boy-7) like this story, so did we as parents. Even better, it went beyond entertaining us. From Brooke of Woodstock, Georgia on 6/3/2013 . This was my first Lamplighter purchase. I bought it for my 4 and 5 year old daughters, not really sure if it would be too advanced for them or not. We listened to it on a road trip and since returning home, they've listened to it again and again. Because of this CD, we've talked about pride, humility, putting others first, being responsible, servanthood, generosity, and many other character lessons. We have, and will continue to, enjoy this book on CD. From Marilyn Perkins of Deer Park, Wisconsin on 4/4/2013 . I heard it on the radio presentations and thought it had so much merit I needed to get it for my grandchildren. I travel with them quite often and thought it would be great travel material for passing the time, learning valuable lessons, and conversation stimulation. Thanks for such quality presentations. As a parent, I especially love the encouragement to never give up on our children, no matter how difficult they may be. God has entrusted this sacred task to us, and we must not only stay the course, but we are sometimes required to do difficult and painful things. Nevertheless, God uses those disciplines and sufferings to bring about spiritual metamorphosis in the lives of those we love. We dare not save our children from the trials and expediencies of our Heavenly Father! From Anonymous of Vancouver, Washington on 2/4/2013 . We ordered this as a gift after listening to it as a family this past summer. What an excellent story for the whole family. Fascinating Story. Only wish it was longer! From Paul Kaminer of Red Springs, North Carolina on 1/27/2013 . Very interesting story and very compelling. I'm 60 and it is a can't-stop-listening story. The universal theme and interesting plot will be interesting to any age, even young children. Like any good book, you get to the end and you want more! At the very beginning the story seems predictable, but this sets you up for the twists and turns along the way. So what is the story line? Like with a good mystery, sometimes the less said the better. You won't regret hearing this story. From Marcy Caldwell of Miamisburg, Ohio on 11/30/2012 . 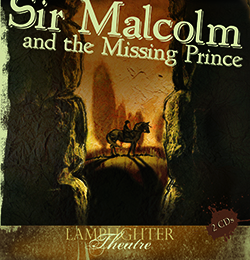 Our first experience with Lamplighter was "Sir Malcolm and the Missing Prince". This story and presentation was SO EXCELLENT it is hard to compare anything else. Looking forward to all of the offerings of the dramatic presentations by Lamplighter. Sir Malcolm gets an A++++ - wish I could afford to buy that one for every child I know. From Marcy Caldwell of Miamisburg, Ohio on 11/17/2012 . From Kristenea LaVelle of Spokane, Washington on 11/12/2012 . Our family really enjoyed this audio drama. I must say that it is one of my personal favorites as well. Thank you for such a wonderful production! From Sara of Bethlehem, New Hampshire on 11/8/2012 . My son received this as a gift (he is 7) and we enjoyed it so much that we purchased this as a gift for a family friend. This is a moving story about learning humility and contentment and the importance of relationships. All our kids (ranging from 3 -10) were able to follow the story and enjoy it.